When I finished editing Falling Glass last October I hated the bloody book. I'd read it through half a dozen times and that was enough to kill any love I had for the jokes, the set pieces, the characters etc. I was also discouraged by the rejections I was getting from American publishers who felt it "wasn't commercial enough." My old house, Scribner, passed, Henry Holt passed, St Martin's passed. We started showing it to smaller presses who often boast about publishing "outsider voices from different perspectives" etc. and they all said no too. My Australian publishers didn't even tell me when the book was coming out and I only knew it was out here because I happened to chance upon it in a shop. But then the reviews started coming in...And the reviews told a vastly different story from what the voices in my head were saying. Spinetingler Magazine was one of the first out of the gate and they loved the book. Spinetingler ran a review and an extract and an interview. The next review I read was in The Guardian newspaper and the Guardian loved it too. Next came an extremely positive review in the Irish Times (and this from a paper who have sent me a few rockets in the past). Last week I got a lengthy write up at The Crime Of It All and just yesterday I got a great review in the Irish Independent from Declan Burke - a man who knows his onions where crime fiction is concerned. Declan's review was interesting because Falling Glass got the lead in the paper above John Banville's latest novel. There have been other reviews along the way on blogs, in newspapers and on Amazon. The only people I've come across who really disliked Falling Glass were a couple of listeners on Audible who couldn't get into the story or "found the narrator dry" whatever that means. My old pal Bookwitch wasn't convinced by the ending and I've had a few emails from people who also felt the same...In general though, as I said in a blog post last week, this is the best reviewed book I've had since Dead I Well May Be. Johnny Foreigner has also gotten on board. Serpents Tail have sold the rights to Germany, France and a couple of other EU countries which means that you can get Falling Glass in the entire British Commonwealth and most of Europe but, crucially, not North America. I have to say that I beg to differ with all the American publishers who claim that the book is not commercial in the US market. 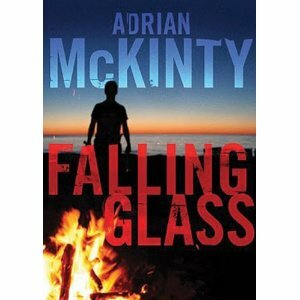 There is one place and only one place where Falling Glass is available in the US and that's on Audible.com. On Audible, as of today I've had 132 ratings, an average rating of 4.11 (out of 5), and twenty one written reviews. By way of comparison, despite heavy advertising, a recent profile in The New Yorker, radio and TV interviews and a book tour, the latest John Banville crime novel has 10 ratings, 1 customer review and an average rating of 3.30. I'm not knocking Banville but I am knocking the US publishers who think there is no market for me or my novels. The listeners and - a fortiori - the readers are out there!